In response to suggestions by a citizen, two members of the Oconee County Board of Commissioners at the Aug. 4 meeting committed to begin holding town hall meetings to learn about citizen concerns. The board also passed an organizational policy at the same meeting that gives it more control over day-to-day operations of the county, the county budgeting procedures and its own agenda. Town hall meetings could be a second source of power for the board, as these meetings could increase the amount of contact the board as a whole has with members of the public. County Clerk Gina Lindsey found the commitment on the part of board members Margaret Hale and Jim Luke to the town hall meetings important enough to include it in the draft minutes of the Aug. 4 meeting, but none of the three newspapers that covered the event made any mention of it. The newspaper reports focused on how the changes would affect Board Chairman Melvin Davis. Consistent with Davis’ contention, the reports in the Athens Banner-Herald, The Oconee Enterprise and The Oconee Leader said that the vote took power away from Davis and shifted it to Administrative Officer Alan Theriault. Under the old organizational chart, most department heads reported to Theriault, who reported to Davis. Davis then reported what he wanted to the other four members of the board. Under the new organizational chart, all department heads except one report to Theriault, who reports to Davis plus the other four members of the board. What is new is that the four members of the board now will get their information directly from Theriault rather than from Davis. The ordinance adopted unanimously by the board makes the four members of the board stronger by giving them all access to Theriault, but it weakens Davis’ power only because the other four members become his equal in getting information from Theriault. Davis is a full member of the board and will have the same access to Theriault as the others. The media framed the story as an effort by four members of the board to decrease Davis’ power. The media could just as easily have cast the story as an effort by the four members of the board to increase the power of the board as a whole. Davis has been straightforward in his opposition to the ordinance, drafted by the county attorney at the request of the other four members. Davis argued at the Aug. 4 meeting that the ordinance changes the form of government in the county illegally. County Attorney Daniell Haygood, who reports to the full board as specified in state statutes, said at the public hearing at the Aug. 4 meeting that Davis has his current power not because it is specified in the state laws governing the county but because he has asserted it. According to Haygood, the other members of the board, through the ordinance, simply were asserting their power, as allowed by the state statutes for the county. Davis, who by statute votes only in the case of a tie, asked Clerk Lindsey to record his opposition to the ordinance in the minutes, and she did so. Until the Aug. 4 meeting, the four members of the board had done little to communicate to the public about the goals of the ordinance, leaving Davis to make his case, with the help of The Enterprise, that the ordinance was an illegal attempt to change to a county manager form of government. Commissioner John Daniell asked Davis at the beginning of the public hearing on the ordinance on Aug. 4 for a chance to lay out the time line for discussions that had led to the proposed ordinance. Daniell said those discussions had begun in 2005 and had included opportunities for the public to observe and comment. The central argument advanced by the four board members is that Davis used his monopoly of access to County Administrator Theriault and county department heads to keep the board in the dark about issues before it. By controlling that information, they said, Davis weakened their ability to make informed decisions on issues that came before them. The job description for Theriault as administrative officer of the county in place before the Aug. 4 vote stated that he was "responsible for assisting the Board of Commissioners with the overall administration of the county government." The job description further said that day-to-day management by Theriault was to be "coordinated with the Chair of the Board of Commissioners who is the Chief Executive Officer." Neither the 1998 enabling legislation for the county nor earlier legislation makes mention of the administrative officer position, so the board has the right to redefine the job description or even eliminate the position entirely. The ordinance passed on Aug. 4 rewrote the language to say that the administrative officer "will keep the Chairperson of the Board of commissioners, as the Chief Executive Officer, apprised as to day to day matters" but eliminated the stipulation that the administrative officer is to coordinate with the chair of the board. During the Aug. 4 public hearing on the ordinance–the third and final chance for citizens to speak before the vote–Michael Reuter said there has been a lack of opportunity for citizens to communicate with the board across time and suggested that some formal mechanism be put into place to change that. "I’ll make a commitment now that in the future I will schedule at least two to three town hall meetings every year," Commissioner Hale said. At the end of the meeting–after members of the public again spoke about the ordinance already passed, Luke said he "he would like to go on record supporting that idea" of town hall meetings and said that the board should hold at least one town hall meeting in the future to see if it works. Members of the Board of Commissioners all are elected at large, but Hale lives at 1901 Salem Road in Farmington in the southern part of the county, Chuck Horton lives at 1061 Ramblewood Place east of Watkinsville, Luke lives at 1320 Meriweather Drive in the urbanized north central part of the county near Bogart, and Daniell lives at 1922 Elder Road in the western part of the county near North High Shoals. Davis also lives in the southern part of the county, at 1772 Oliver Bridge Road. The majority of those who have spoken at the three public hearings opposed the ordinance, and many echoed Davis’ charge that the county was illegally moving to a county manager form of government. Davis said that the county was going to a county manager form of government simply by having Theriault report to the full board rather than to him alone. The state does not define a county manager form of government, and counties differ in the responsibilities of persons assigned this job. The state does allow counties to create a county manager without changing their enabling legislation. At the end of the public hearing, Davis also made the assertion that "approximately 24 percent" supports the ordinance and 76 percent "of the public" opposes it. 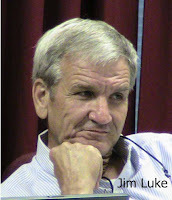 Only when challenged by Jim Luke did he acknowledge that his count was based on those who spoke at the public hearings, onletters to the editor and on email "the board" had received. In response to Luke’s probe, Davis said that his email analysis did not include any messages sent to individual board members, but only those sent to him. Davis did not say how problematic it is to judge public opinion based on email, letters and public statements. Nor did he acknowledge the vast majority of the citizens who likely have not taken enough time to have an opinion on the matter. Esther Porter, who ran against Hale in the July 2008 Republican primary, also told the board that "from what I gather, most citizens are not in favor of this. And I cannot understand you not taking that into consideration." Porter said she was not sympathetic with the board members’ assertions that they could not get information they need at present. "It is your job to find out what is going on," she said. "Don’t tell me you cannot get communication." Most of the citizens who spoke at the hearings assumed that the changes being proposed were radical, particularly as they relate to Administrative Officer Theriault. The old job description for the administrative officer said the "Focus of this position will be developing, administering and coordinating the County’s public policies." The new ordinance includes a job description for the administrative officer that says that the "Focus for this position will be on administering the county government and on developing, administering, and coordinating the county’s public policies." In the past, the organizational chart said Theriault reported only to Davis. In the new organizational chart and in the job description, he reports to Davis plus the other four members of the board. The job description for the finance director also was changed by the ordinance. In the past, the finance director reported to the chairman of the board along, according to the job description and the organizational chart. The ordinance passed on Aug. 4 said the finance director reports to the administrative officer on a day-to-day basis for operational matters and to the full board of commissioners, rather than just to Davis. In the old organizational chart, which Davis created, the finance director, the director of Human Resources, the director of Strategic and Long-Range Planning, the director of the Utility Department, and the director of Economic Development, all reported directly to Davis, as did Theriault. All other Department heads reported to Theriault. Under the organizational chart adopted as part of the ordinance on Aug. 4, the administrative officer and the finance director will report to the full board, including Davis, and all other department heads will report to Theriault. The 1975 enabling legislation for the county specifies that the county clerk reports directly to the full board, and that will remain unchanged. The ordinance passed on Aug. 4 also specifies that the county budget will be prepared with involvement by the full board. In the past, Davis prepared the budget with the staff and presented it to the board. The new ordinance specifies that "Commissioners have the right to have a matter placed on the agenda." In the past, Davis prepared the agendas. The new ordinance has only one section dealing with the duties of the chairman of the board acting as chief executive officer. The board delegated to the chairman duties he already performs, such as representing the county on intergovernmental bodies and doing public relations work for the county. In fact, much of the power of the chairman of the board comes about as a result of participation in intergovernmental bodies. Davis serves on the Upper Oconee Regional Water Council, for example, after being appointed by the governor, lieutenant governor and speaker of the House. Commissioner Horton said at the end of the public hearing that the Board repeatedly has tried to reach an agreement with Davis about power sharing without success. "I don’t know of any group of people who tried to find a route to resolve it anymore than the majority here," he said. "I wish we had." Davis’ intentions regarding the proposed ordinance were revealed at the June 30 regular BOC meeting, when County Attorney Haygood presented a draft of the ordinance to the board. Haygood also reported to the public that Davis had proposed three changes to the ordinance and that the other board members had not supported the changes proposed by Davis. Haygood did not report specifically what Davis had proposed, however, so I did an open records request to ask for the proposals. Davis asked that the job descriptions for the administrative officer and the finance director both be changed by inserting the words "with supervision by the Chairperson" into the statement of responsibility. He also wanted that phrase inserted into the body of the ordinance where the responsibility of the administrative officer also was stated. At the July 28 meeting, Davis asked that the board postpone action on the ordinance, as he did again at the Aug. 4 meeting. In both cases, he said the board should instead change the enabling legislation if it wanted to make the proposed changes. What Davis did not say was that the enabling legislation can be changed only by a vote of the Georgia General Assembly, that the bills to make those changes can be introduced and passed only with the support of Rep. Bob Smith and Sen. Bill Cowsert, who represent the county in the General Assembly, and that, by tradition, bills are introduced by local representatives only when there is consensus among local officials. In other words, Davis’ opposition is enough to guarantee that the enabling legislation will not be changed. It is a complicated system of government, and it is hardly surprising that citizens who spoke misunderstood much of it. The media coverage has done little to explain what really was being proposed. Franklin Shumate, who spoke at the July 28 and Aug. 4 meetings, was particularly fixated on what he termed the changes in "the form of government in Oconee County" and said the changes were inconsistent with the existing enabling legislation. He also said he did not want members of the board "arguing among themselves publicly" and proposed instead that the board solve the differences in a "back room in executive session." This would be a violation of the state’s open meetings laws, as Commissioner Daniell noted at the Aug. 4 meeting. What happens at this point depends mostly on Davis. If he adapts to the changes in the reporting lines of Theriault, Finance Director Jeff Benko and the other department heads, citizens probably will notice little difference in their county government. One thing citizens should notice at commission meetings and at the proposed town hall sessions is that all members of the board know about the issues before that government. I’ve edited the county’s recording of the Aug. 4 meeting to include only the public hearing and citizen comment components. This edited version is on my Vimeo site. The clips above come from that edited version.